Now that it’s warm out, it seems the mosquitoes are everywhere. Leaving you with the joy of dealing with bug bites. 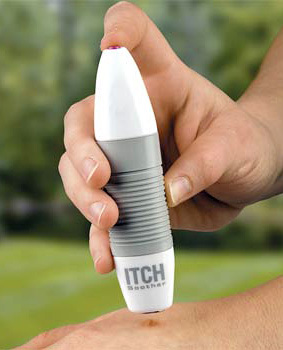 There are various ways of killing the itch, be it in cream form or a convenient applicator bottle. If you can’t stand using the creams though, you could always take a slightly more hi-tech approach to killing the sting of those pesky bug bites. Relieving the itch can be a bit important, since if you cave in and start scratching it can cause an infection. Which only extends the misery even longer and no one wants to deal with that mess. This works for all size bug bites, but larger insect bites may take several applications to take away the itch. To work it just press the head of it onto the bite and hold it there. It then neutralizes the insect-injected proteins that create that great itching feeling. It runs on 2 AA batteries and you can purchase it for $16.99 from Improvements.